In this collision of minds, spirits and aesthetics, virtuoso musicians are pushed together with experimental improvisers and composers for an experiment in new unimagined sonic directions. This undulating gentle and cacophonic experiment is stimulated by London-based Korean taegŭm virtuoso Hyelim Kim and Sydney-based percussionist Claire Edwardes interacting with specially commissioned compositions by Western Sydney associated composers Clare Maclean, Diana Blom, Eve Duncan Petar Jovanov, Bruce Crossman, and Japanese composer Koji Nakano as well as three western Sydney improvising bands—Tabua-Harrison, Espadrille Duo, and De Vilder-Graham Duo. Poetic Energies Across Sonic Space explored the Chinese cross-artform attitude of the Chinese literati towards artistic creation and scholarship to express the dynamic relationship between Australia and China within contemporary Australia. Venerable ethnomusicological scholar Edward Ho in “Aesthetic considerations in understanding Chinese literati musical behaviour” (Ho 1997, British Journal of Ethnomusicology) notes this confluence of creative philosophy across artforms. 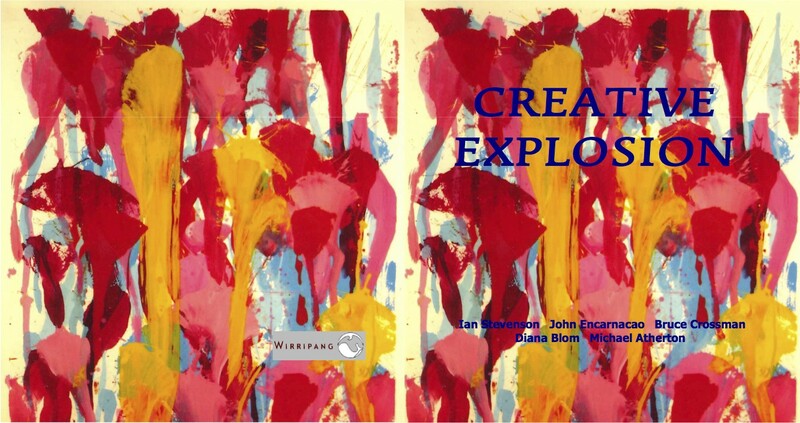 This interaction of energies across artforms were the basis of this interaction between poets, calligraphers and visual artists/photographers, musicians and composers in poetically inspired visuals interacting with sound. An informal round table with artists and scholars contextualized and explored the multi-artform creativity. It consisted of two multi-dimensional creative concerts and symposium: firstly, a public concert for the evening at Kingswood; secondly, an on-campus concert at lunchtime at Kingswood; and thirdly an informal artists discussion. Firstly, there was “Poetic Energies Across Sonic Space” as the evening concert with respected Sydney erhu performer Liu Ying, leading Australian new music percussionist Claire Edwardes, international guzheng player from the cutting edge Hong Kong New Music Ensemble, Chiu Tan Ching, and leading Australian qin performer Tony Wheeler with iconic blues guitarist Dom Turner (Backsliders). They interacted with visual media from respected Australian photographer Dr David Cubby, calligraphers/ painters from the Sydney Chinese community, such as Luping Zeng and Shen Wednesday, as well as British-Australian artist Jo Davis. 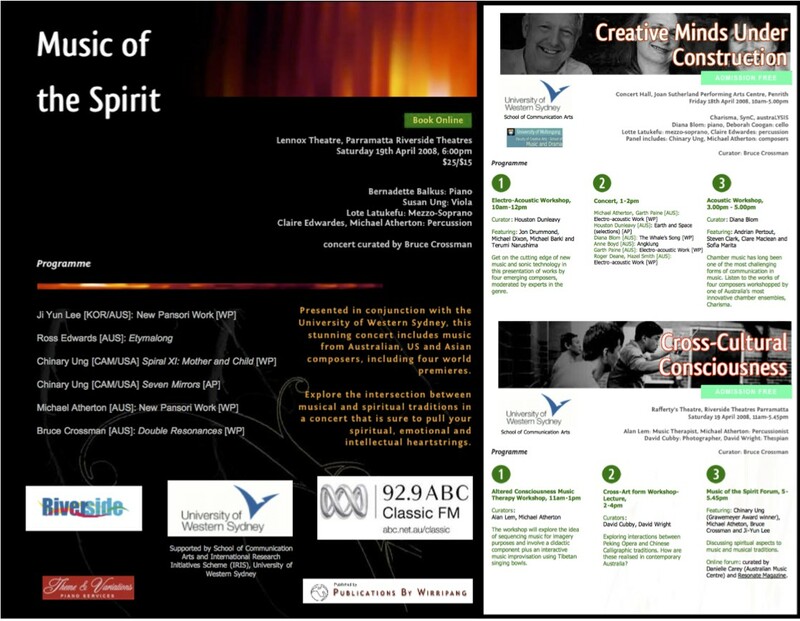 This concert will seek to involve multiples disciplines from the School of Humanities and Communication Arts and beyond, including poet Dr Kate Fagan, playwright Dr David Wright, and Music area composers/sound artists Dr Clare Maclean, Dr Ian Stevenson, Dr Holly Harrison and Associate Professor Bruce Crossman. 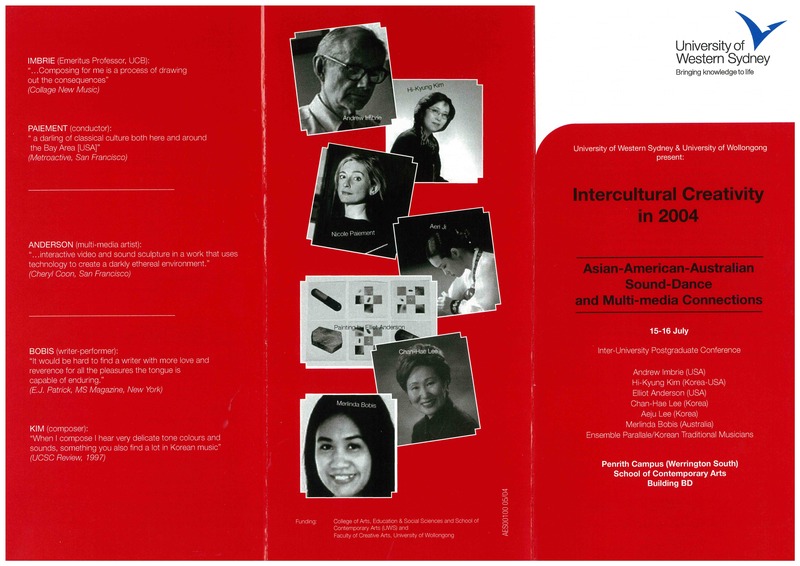 The creative aesthetic behind this project was to have a strong intercultural focus featuring Asia-Pacific traditions of Korean samulnori drumming, Filipino kulintang, Japanese shakuhachi ‘moment’ aesthetic and East Asian string techniques (Korea, Japan, China) interacting with contemporary music. These musical aesthetics were contextualized by poetry readings and improvisation, a series of intercultural ethnographical films, and panel and forum presentations. The festival featured concerts by Ensemble Offspring with UWS staff and postgraduate students with Workshops, Panels and Forums, which included two invited speakers, percussionist Claire Edwardes and composer Damien Ricketson. 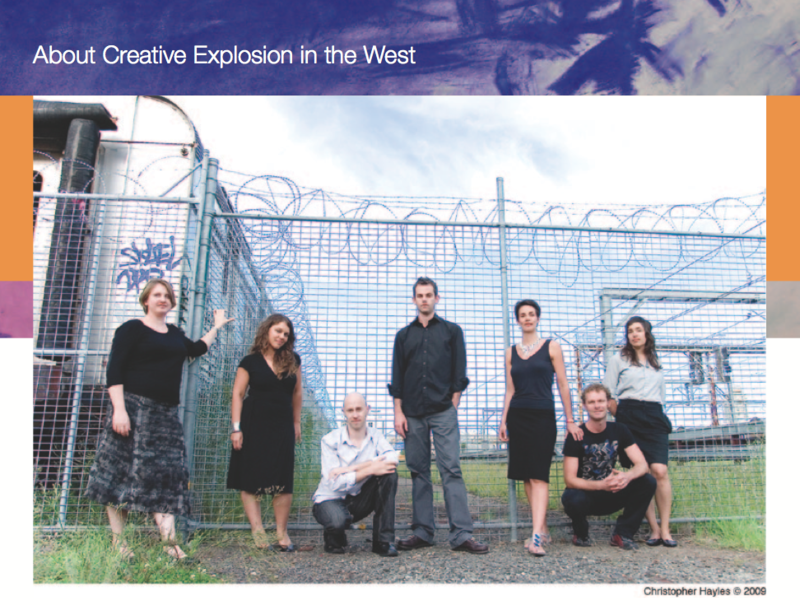 The purpose of this Asia-Pacific investigation—a collection of reflective and analytical writings drawn from a series of concerts and workshops—was to explore music with a spiritual basis from around the Pacific basin related to Western art-music composing, discussing its sources and methods towards identifying an Asia-Pacific musical identity within the Western art-music tradition. This emergent Pacific musical identity can be viewed as something outside mere insider/outsider paradigms to instead be a complex fusion of traditional Asian and Pacific cultural values alongside transported European-originated ideas. Perhaps this complex mix of Asian-Pacific values and European-Pacific migration pattern influences can be seen as a value system in itself that centres around place—the Pacific. In a nutshell, this Pacific voice could be defined as having three essential essences: un-dampened resonance, eclectic attitude, and metaphysical time related to the Pacific. 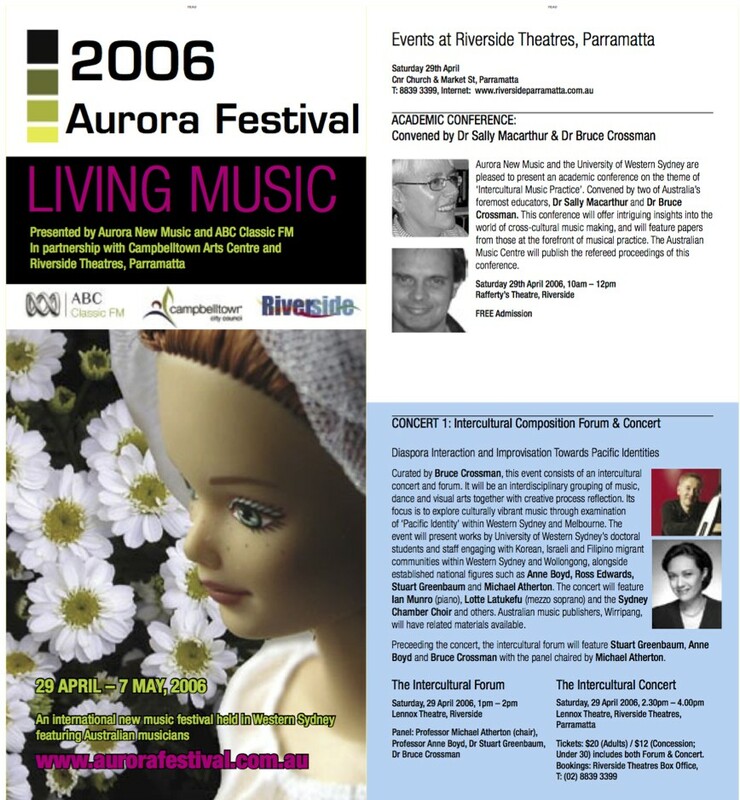 These events took place in the prestigious Riverside Theatres complex within the Lennox Theatre, Riverside Theatres in the heart of the heart of the Western Sydney area, Parramatta. The forum featured Stuart Greenbaum, Anne Boyd, Michael Atherton and Bruce Crossman. It included creative process exchanges between the composers and featured improvisations such as Greenbaum’s jazz, Atherton and Crossman’s cross-cultural collaboration, and Boyd’s provocative meditative silence. In the Intercultural Concert, ancient musical traditions were presented such as Korean Samulnori from the Korean Catholic community, Filipino chant in the Tagalog language, Gregorian chant from the Sydney Chamber Choir and Jewish Synagogue chanting from a former cantor at the Sydney Synagogue. These traditional musical examples lead into contemporary Australian music influenced by these traditions and the interaction between jazz and classical music. 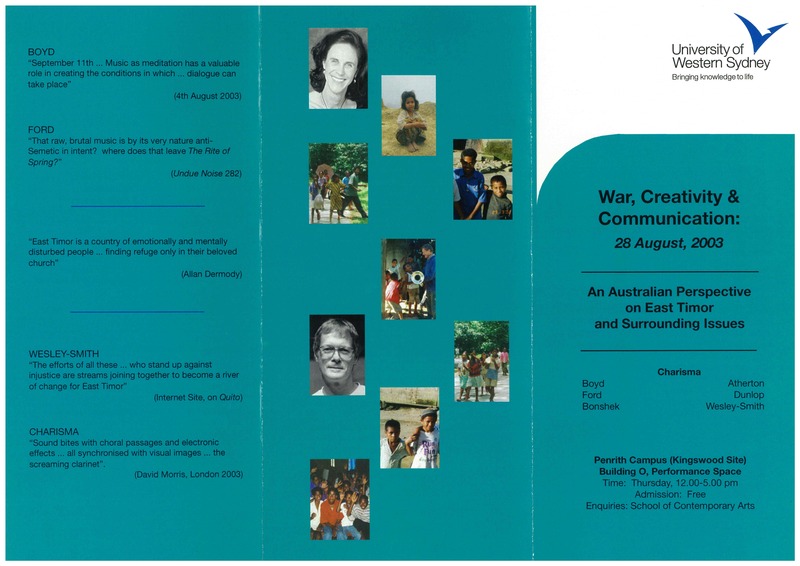 Sally Macarthur and Bruce Crossman convened the accompanying conference from the University of Western Sydney.